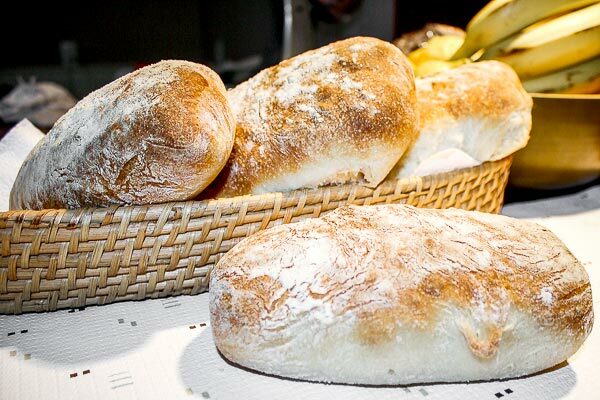 Ciabatta is probably one of my all time favourite breads. 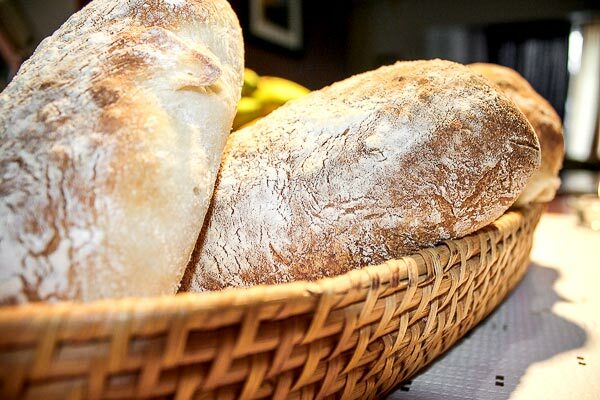 Being done with wheat flour and yeast, can come in many forms and variations though the original Italian design of the loaf is somewhat elongated, broad and flattish. However, since I am a big fan of toasted sandwiches, I decided to give it a try and bake some today. The end result was way beyond my expectations and I figured this is definitely something that needs to be shared. Start out by measuring your flour, for this I used 9 cups of flour and added it to the bowl of my mixer. To the flour I added 2½ tsp of yeast and 1 tsp of salt. Using the hook attachment of your mixer start mixing everything, and gradually start adding the water to the flour mixture. We are adding 4 cups of water. When it’s all mixed together, add 5 tbsp of vegetable oil to the mixture. Continue mixing everything with the hook attachment. When it’s all mixed together, place a little bit of oil onto your counter or wherever you can knead the dough for a few minutes. You don’t need a lot of oil, just a bit so it doesn’t all stick to the counter. 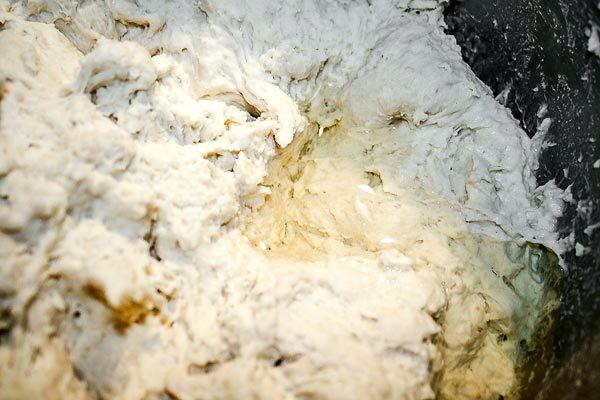 Turn the dough over onto the oiled surface and start kneading the dough for a couple minutes. Remember it will be a sticky dough. Shape it into a ball. Place the dough in an oiled bowl, oil the dough as well and cover it with plastic wrap. The dough needs to rise for a while now, it should more than double, probably triple, so I let mine rise for about 2½ hours. Turn the dough over a well floured surface and cut the dough in 8 pieces. Flour each piece well. 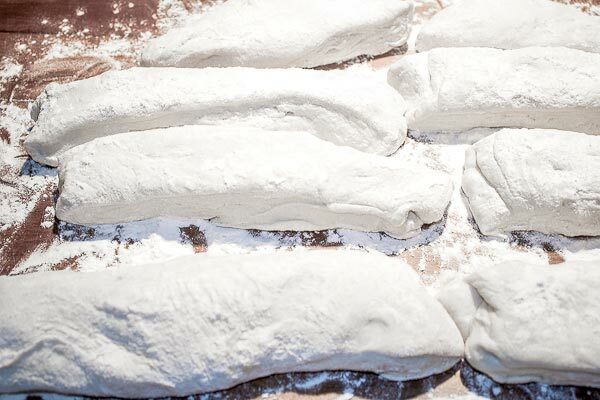 Take each piece and form it into the shape you want for your little loaves. Now you have to let your rolls proof again for another half hour to 45 minutes. A few minutes before it’s time to bake them, preheat your oven to 500° F / 260° C and… let’s get baking. 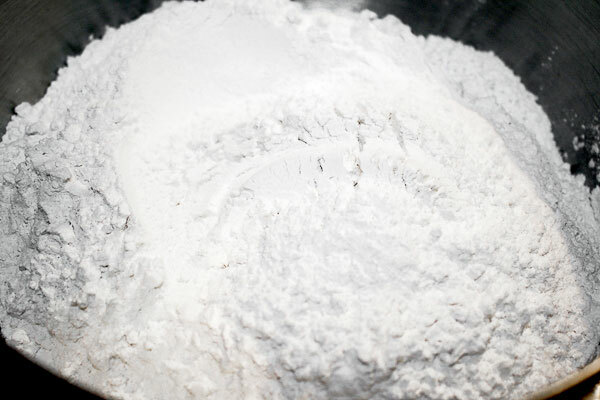 Add flour to the mixing bowl of your mixer and add the yeast and salt to it. Mix well, so the salt and yeast is well incorporated. Using the hook attachment of your mixer, start adding water gradually while mixing. The dough should be pretty sticky. Add oil to mixer and keep mixing for about 5 minutes. Turn the dough over onto an oiled surface and continue kneading for another 3 minutes. Place the dough in an oiled bowl, oil the dough all around and cover the bowl with plastic wrap. Let the dough rise for 2½ hours. 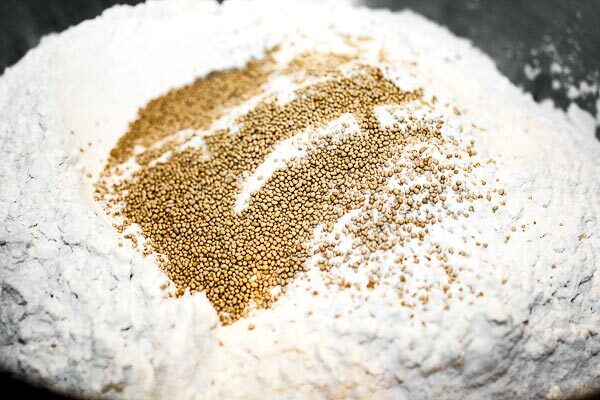 After 2½ hours turn the dough over onto a well floured surface and cut it into 8 pieces. Form each piece into a roll and let it rise again for another 45 minutes. Preheat oven to 500° F / 260° C a few minutes before placing the rolls in the oven. Bake the bread for 12 minutes. I’m not much of a baker, although have dabbled a little with basic bread. The yield for this is high, can I simply halve the ingredients fora smaller batch? I don’t see why not, this recipe does not require any weird ingredients anyway. Then again, any bread recipe can be adjusted according to your liking/needs.